Bellevue was founded in 1815 by a small group of settlers from Genesee County, N.Y., headed by Mark Hopkins. They settled on what is now Main Street and the new community was called Amsden Corners. The first store was opened in 1823 by the same Thomas Amsden for whom the town was named, and although other stores followed, the rough log structure remained the general store and gathering place for many years. Initial attempts to educate the children were made in 1821 when a school was opened in a remodeled log building, formerly a blacksmith’s shop. Located in northern Ohio halfway between Cleveland & Toldeo is Bellevue Ohio. Bellevue has been a railroad town since the 19th Century when the Nickle Plate Road laid tracks through it. Home of a large railroad yard, multiple mainlines, and even a railroad museum, this town is well known by avid railfans. The first election was held in April 1821 when just two justices of the peace, and three trustees, two overseers of the poor, two fence viewers, three appriasers of personal property, two constables, a treasurer and a clerk were reelected. In the mid 1830’s James H. Bell, a civil engineer of the Mad River & Lake Erie Railroad, named the new station “Bellevue” suggestive of his name. By 1836 the post office name was changed to Bellevue. The village was further enhanced by the Toledo-Norwalk Railroad that was the connecting link from New York to Chicago in 1852. The Nickel Plate and the Wheeling & LakeErie railroads were located through Bellevue in 1882-83, which added several thousand people to its population by the century turn. The Pennsylvania Railroad was located through here in 1891. All are now part of the Norfolk & Southern railroad system. In 1886 H.C. Stahl moved his Ohio Cultivator Company to town. Bellevue has been a progressive city throughout then early 200 years since the first settlers arrived, as is shown by reviewing the rapid growth of the city in population, area and in the construction of new businesses. 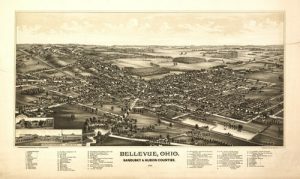 Want to learn more about Bellevue, Ohio? Here is our Official City of Bellevue Website.